Having missing teeth can have a huge negative effect on your life. Nowadays its possible to replace lost teeth with various dental teeth implants treatments. The most common solutions to missing teeth are using dentures , fixed dental bridges or undergoing dental implants treatment. Each dental implant treatment option is has its own advantages and disadvantages. Understanding which dental treatment is the correct treatment for you is key. Dentures have been used for many years as a solution for tooth loss. Technology has improved and dentures are far better today than before however they are removable prostheses which is uncomfortable for many. In the UK there are millions of people who depend on removable dentures to replace missing teeth. Some may only need a few teeth replacing however many do have full dentures for all missing teeth. Dentures are relatively inexpensive and can be used to replace upper or lower teeth. 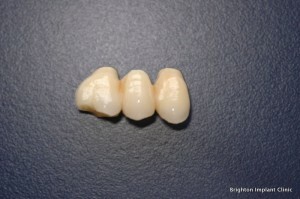 However using dentures can be problematic as they are removable. Many have problems keeping dentures in place, and movements in the dentures can contribute towards sores along the denture borders. It is recommended to remove dentures at night to allow the oral tissues to ‘breathe’ and this can have another negative impact on the denture wearer. Dentures have also been shown to have a negative impact on adjacent or neighboring teeth due to constant movements during function. 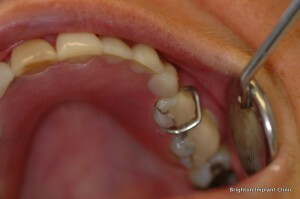 Dental Bridges can be used to replace missing teeth. In order to have a bridge there must be suitably strong healthy teeth adjacent to the spaces which need tooth replacement. 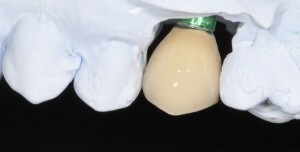 A dental bridge will become fixed onto the adjacent teeth. In order for this to happen the adjacent teeth need to be ‘prepared’. The preparation of the adjacent teeth is a destructive process and will cause long term problems to the adjacent tooth in the long term. Dental bridges are more comfortable than dentures however they are not very conservative as they damage the adjacent teeth. The ideal choice to replace missing teeth is to undergo dental implant treatment. The procedure is carried out under local anesthetic and does not take longer than 1 hour to complete ( in most cases) For anxious patients conscious sedation can be used. Dental implants are made of titanium and act like artificial roots for dental implant crowns or bridges. Dental implants become directly fused into the jawbone and feel and function like natural teeth. 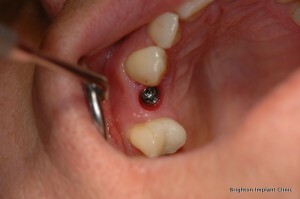 Dental implants need to be cared for in the same way as natural teeth. Daily brushing and flossing is recommended. After undergoing dental implant treatment, your implants should be monitored by your dentist to ensure that they free from infection and tightly secured. Unlike dentures, dental implants feel like real teeth that last for a very long time and sometimes even a lifetime. Dental implants are more comfortable and require less maintenance in the long term. Many patients are experiencing the benefits of dental implants today. For More information about Dental Teeth Implants Feel free to Contact Brighton Implant Clinic.